It’s Friday… the best day of the week! Many happy things going on lately. Grad school starts in 3 weeks. I’m excited and nervous. I won’t be all alone; one of the guys who went to my high school also got into my program, so at least I’ll have one friend. Nevertheless, the nerves are definitely there. DanceWorks Boston is back in action. I’m in 5 routines and could not be happier that I get to dance 3 nights a week. It keeps me sane, the show is going to be out of this world and I’ve met some great friends through it. And my piece is going to be unreal, just saying. I ran 3.1 miles yesterday at a 9:50 pace. My first 5K pace was around 10:50 min/mile, so I was thrilled to get through the same distance today, 3 months later, a whole minute per mile faster. I felt great doing it and I was super sweaty at the end. Win. I have 2 more 5Ks and my first 10K coming up. Chelmsford, Salem and finally, the Tufts Women 10K in Boston. Obviously I still have more training to do for the 10K, but I think I’ll be able to pull it off. P.S. If you’d like to be my running buddy for any of these, please let me know! I plan on running a half marathon before next spring. Yes, you heard me correctly – a half marathon. 13.1 miles. I considered the Cape Cod Half at the end of October but at the moment, it’s not in the cards. I have some awesome training plans and lots of support thanks to my runner friends. A half is definitely happening within the next year. I currently have my eye on the 2012 Great Bay Half Marathon in Newmarket, NH. We’ll see. I made a kickass dinner last night. 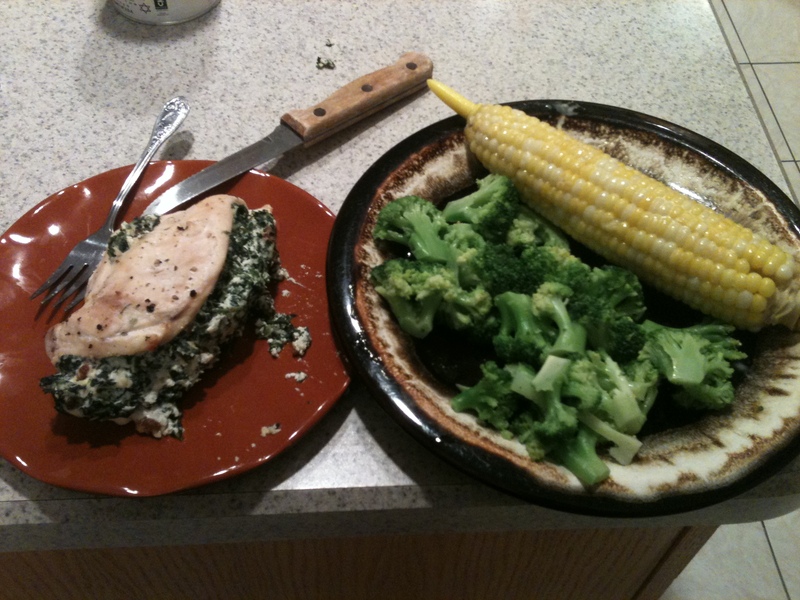 Chicken breasts stuffed with a spinach, low fat ricotta cheese and pancetta mixture, spiced corn-on-the-cob and broccoli. Anything with spinach and cheese just calls my name. I’ve lost 10 pounds. Thanks Weight Watchers, you really work! I want to know… what’s happy in your life? Jani, you always know how to brighten up my day!! Wow marie, way to go on the running! That’s awesome to see how much improvement you can make in just a few months. Can’t wait to hear about everything you have lined up for the fall 🙂 and congrats on the healthy eating & exercise leading to healthy weight loss, it’s always nice when hard work pays off like that! Thanks Katie! The running is definitely helping. Maybe I’ll look like you do post-baby one day! That chicken looks mad good I want some lol. Half marathon? Damn babe lol that’s awesome but crazy id never be able to run that long. Well I cannot wait to run the Salem 5K with you!! I’m also thinking about doing DanceWorks in the winter/spring soooooo if I could have a Marie dance bootcamp for jazzy/hip hop stuff that’d be fabulous! Kim, we can most definitely have boot camp!